Did you know that if you are dealing with either Candida overgrowth or an autoimmune disease, there’s a good chance you could be dealing with the other as well? In working with thousands of patients, I’ve found it to be incredibly common for Candida and autoimmune disease to go hand in hand because Candida overgrowth is not only very widespread, it actually sets you on the path to autoimmunity. Unfortunately, another aspect the two conditions have in common is that they are frequently missed by conventional medicine doctors. As I write in my book, The Autoimmune Solution, it takes an average of 5 years and 6-10 doctors to receive an autoimmune diagnosis. And doctors often write off the symptoms of Candida overgrowth as signs of stress, aging, or simply being a woman. This is because the common symptoms, including brain fog, fatigue, skin issues, digestive problems, and mood imbalances, tend to be vague, impact multiple areas of the body, and can overlap with other chronic conditions you’ve already been diagnosed with, such as autoimmunity. 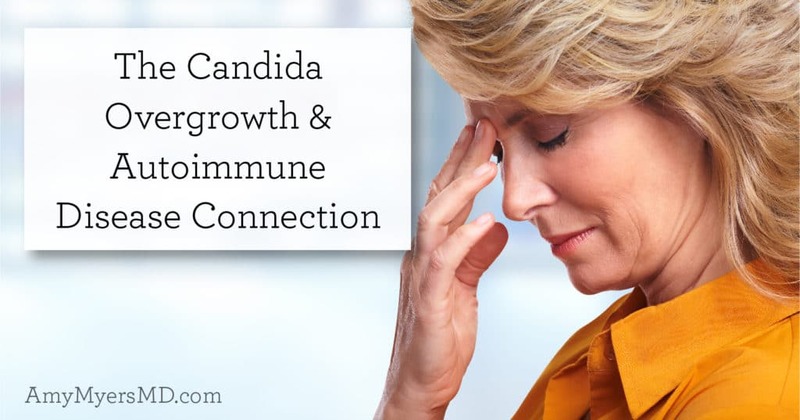 However, once you identify Candida overgrowth as the cause of your symptoms and the role it plays in autoimmunity, you can overcome it in just a few simple steps, eliminating your symptoms and putting you on the path to reversing or preventing autoimmunity. 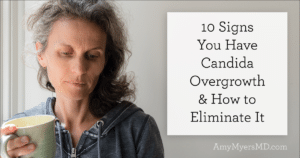 So let’s dig into what Candida overgrowth is and how it can lead to autoimmunity, as well as how to overcome it using dietary and lifestyle changes. Candida is a fungus, a form of yeast, that is naturally found in your mouth and intestines. In small amounts, Candida is essential for your digestive health and helps you absorb nutrients. Ideally your good bacteria, bad bacteria, and Candida that make up your gut microbiome exist in a balanced state. In fact, I like to think of your microbiome as a rainforest, with many different species living together in a balanced harmony. 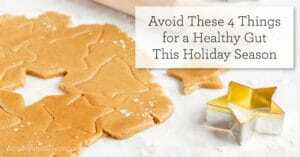 However, if your immune system is compromised, you eat a diet high in carbohydrates and sugar, you take medications such as birth control pills or antibiotics, or are even just dealing with chronic stress, the balance can be disrupted, and Candida can grow out of control and quickly become a problem. You likely noticed that although Candida lives in your gut, many of those symptoms affected other areas of the body. So how does a fungus in your gut wreak havoc on so many areas of your body? The answer is that Candida overgrowth leads to leaky gut by breaking down the walls of your intestine. It may surprise you to learn that your gut lining is only one cell layer thick, and is held together by tight junctions. These junctions act as a drawbridge, allowing teeny tiny boats (micronutrients in food) that are meant to travel back and forth to go under the bridge without a problem. This is an important system that allows vital nutrients from the food you eat to be absorbed into your bloodstream. However, an overgrowth of Candida damages your gut lining, causing the drawbridge to go up and allowing bigger boats that aren’t meant to travel through to cross over, including toxins, microbes, proteins, and partially digested food particles. This in turn can lead to a myriad of symptoms, many of which coincide with symptoms of Candida overgrowth. Even more serious than the laundry list of symptoms above, leaky gut sets you on the path to numerous chronic illnesses, particularly autoimmune disease. I write about this in my books, explaining that Harvard researcher Alessio Fasano has actually identified leaky gut as a necessary precursor to autoimmunity. You see, all of the undigested food particles, toxins, viruses, and bacteria that pass through your intestinal wall and flood your bloodstream trigger an inflammatory response from your immune system in an attempt to fight off these foreign “invaders”. As your gut remains leaky and the invaders continue escaping, your immune system goes into overdrive. It wants to protect you so it sends even more inflammation to battle the invaders. This chronic inflammation exacerbates many of the symptoms above, and over time, your immune system becomes stressed, weakened, confused, and begins firing less accurately, until your own tissues end up under fire and you develop full blown autoimmunity. The tissues that end up attacked determined what type of autoimmune disease you have. If your joints end up under fire, you develop Rheumatoid Arthritis, in the case of Psoriasis or Scleroderma your skin is under attack, and so on and so forth. To make matters worse, many of the substances that leak into your bloodstream look very similar to your body’s own cells, so you can imagine how confusing this must be to your immune system! This process of mistaken identity, known as molecular mimicry, leads your immune system to accidentally attack your body’s organs and tissues in an attempt to protect you. The most prominent example of this is in the case of Hashimoto’s and Graves’ disease, which are autoimmune thyroid conditions. Gluten (which is incidentally the number one cause of leaky gut) contains proteins that look very similar to your thyroid tissue. So when your gut is leaky and your immune system begins to attack the gluten proteins from the toast you had for breakfast or the sandwich you had for lunch, it goes to attack your thyroid as well by mistake. The good news is that by overcoming Candida overgrowth you can repair your gut and reverse (or prevent!) autoimmune disease! In my Candida Breakthrough® Program, I use a proven, 3-step approach to help you beat Candida overgrowth for good. Step one is to starve the yeast by eliminating the foods that feed it. 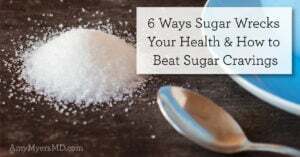 This includes cutting all sugar and alcohol, and limiting carbohydrates such as fruit, starchy vegetables, grains, and legumes to no more than 2 cups per day. Step two is to attack the yeast using supplements that destroy the Candida’s cell walls. I use Candifense™, a powerful blend of plant-based enzymes that break down the cell walls of Candida, and Caprylic Acid, a short chain fatty acid derived from coconut that pokes holes in the yeast cell walls. Finally, step three is to repopulate your gut with the probiotics, or good bacteria, that usually keep the yeast in check. While dealing with Candida, I recommend a 100 Billion Probiotic, which contains 100 billion colony forming units (CFUs) of high-quality, good bacteria. 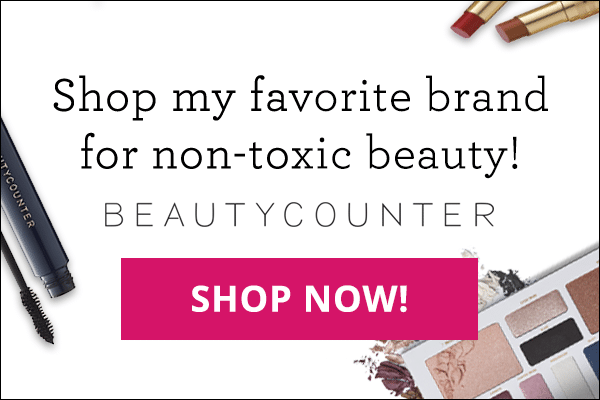 This will not only help restore your gut’s healthy balance, it will also help repair your gut lining so that the Candida can no longer escape and wreak havoc in other areas of your body. 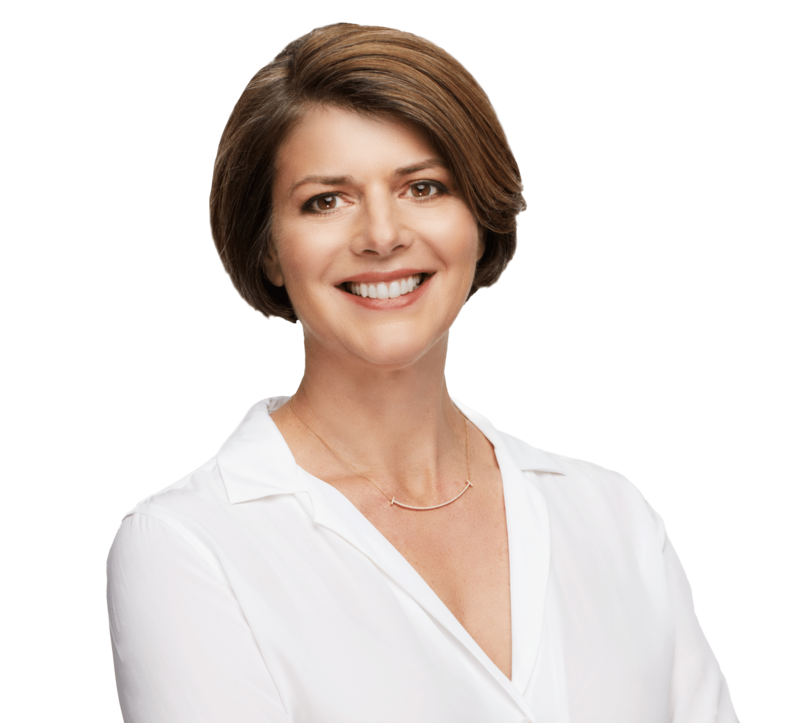 To make it easy for you, I’ve created a complete 30-day program with all of the supplements, recipes, shopping lists, and support you need to eliminate Candida overgrowth and restore your gut. 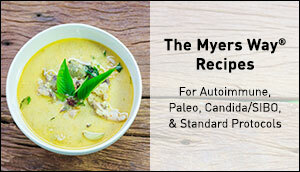 You can learn more about my Candida Breakthrough® Program by clicking here.